The largest nerve in your body is the sciatica nerve, it runs all the way from your feet all the way up the base of the spinal cord. Sometimes you may have a vertebral disk that will bulge out of place and pinch your sciatic nerve. 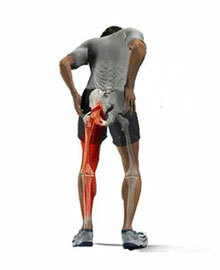 This problem can cause mild and even severe throbbing of the back and leg. If you possibly have a pinched sciatica nerve you might or might not include symptoms of lower back pain, pain in the left or right buttock, pain on one side, pain down the back part of the leg and/or foot pain. Often these symptoms are described as numbness, pins and needles, tingling, burning, and achy soreness that can shoot down through the buttocks to the foot or leg. Especially with activity. An important point is that, even though your pain may be in the legs or buttocks, it is actually a pain that is referred and has nothing to do with any of those locations at all. The condition is caused by a structural element in your lower back impinging on your sciatic nerve. However, your brain just thinks the pain is located in your legs or buttocks. Should you experience any of these symptoms it is important that you are checked out by a Doctor and we encourage you to call us and set an appointment to determine what your condition is. The pain from a pinched sciatica is the result of very real damage to your sciatic nerve. Usually, this damage is only minor and should heal once the pinched nerve is relieved. In most cases it will not result in permanent nerve damage. However, sciatica is nothing to fool with and if you suspect that your symptoms are the result of a pinched sciatica nerve you need to get help immediately. Serious nerve damage could occur and some of the symptoms include an increasing weakness in your legs or the loss of feeling or sensation in your legs or feet, and even the inability to control your bowel or bladder. Should you be experiencing any of these symptoms, please seek immediate medical attention.